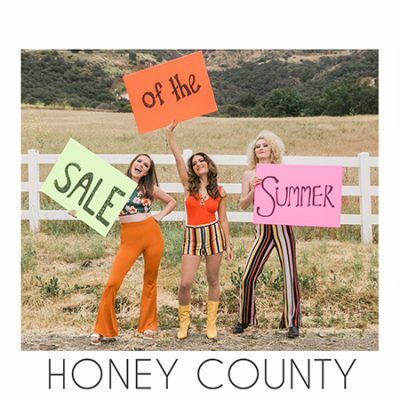 Rooted in three-part vocal harmonies, southern twang, and pop hooks, Honey County is a female country trio formed by singer/songwriter Dani Rose, featuring the stacked voices, songwriting and layered guitar work of bandmates Devon Jane and Katie Stump. As one of Rolling Stone’s Top 10 Artists You Need To Know, the band has maintained a busy schedule both onstage and in the studio, sharing shows with artists like Lady Antebellum, Brett Eldredge, Jake Owen and Easton Corbin while also crafting modern, melody-based country songs. With a prestigious placement of their song ‘Love Someone’ featured in an episode of CMT’s ‘Nashville’ this past summer, the band is excited to be working on new music and plans to release an EP in late 2018. This is countrywide country music, presented in three-part harmony. Keep up with Honey County on their website at www.honeycounty.com. Find the most current Honey County tour dates from our partners at Country Music On Tour, your trusted country concert ticket source! Country Music News Blog participates in advertising programs that help fund the operation of this site. For more information please visit our privacy statement. This entry was posted in Honey County, New Music, Press Releases by Shauna "WhiskeyChick" Castorena. Bookmark the permalink.